On 3rd December I’ll be curating and performing at the Algorave at Vivid Projects. The event will feature Canute, Algobabez, and Charles Celeste Hutchins on audio and Coral Manton, Ryan Hughes, hellocatfood (y’know, me) on live visuals. This will be complimented with a video installation featuring work by Ryan Hughes, RITUALS, Chez.io, Sam Wray, Dario Villaneuva, Sarah Walden, cappel:nord, and catweasel. 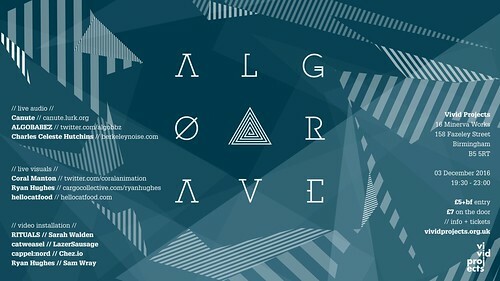 Algorave Birmingham runs from 19:30 to 23:00 on Saturday 3rd December. Tickets are only £5 plus booking fee (more on the door). Get yours now!